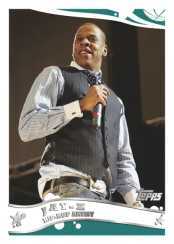 Topps announces it has struck a deal with CEO/President of Island/Def Jam and rap music icon Sean "Jay-Z" Carter to appear in its basketball trading card products. 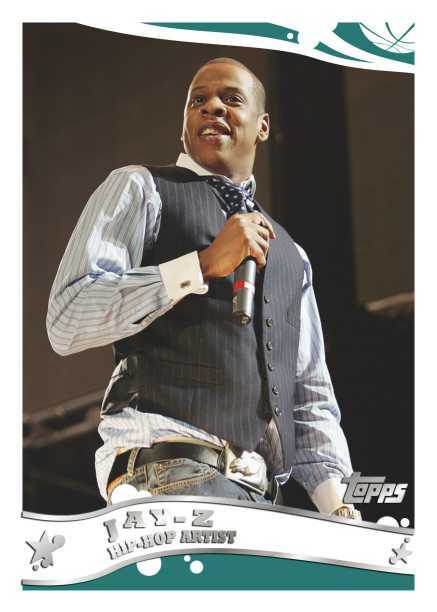 The deal grants Topps exclusive rights within the trading card category for all trading cards including insert cards, autographed cards, memorabilia cards and Jay-Z's image use on packaging and advertising. Jay-Z, multi-platinum selling artist, founder of Roc-A-Fella Records and part-owner of the New Jersey Nets, will make his trading card debut in 2005-2006 Topps Basketball (releases late August) where he will be included as a Rookie Card, a Relic Card and an Autographed Card. Jay-Z will also appear with Allen Iverson on the release's box. Jay-Z headlines a list of celebrities, including Carmen Electra, Shannon Elizabeth and Christine Brinkley, who have a rookie card in 2005-06 Topps Basketball.